Shouldn't Macey (Ash's rival in the silver conference who also had a crush on him) also be a significant other? I'm not sure. Did she play a big part in the Silver Conference? I don't know much about the character. 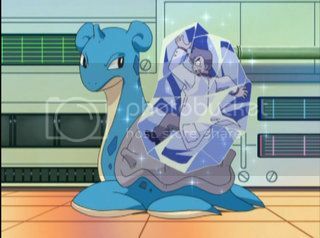 I was not sure about The Warden as he appeared in the banned Dratini episode. Or Dr Akihabara as he was in the banned Porygon episode. I'm doing them alphabeticaly and in order of appearence now. And we are up to about 178 characters. Including theses I have just posted. Just like to point out you have a Rank 3 (Lilian) in with the rank 4's. Can I just point out that Butler has been put of the list twice. Once as a Supporting Character and once as a Misc Character. i'v just had a full day at college, my mind is going..
Well I actually think of him as a Misc character as he only appeared once and it was in that movie. Although in the actual movie he does play an improtant role as far as I know. I've not actually seen the movie yet either. I've really been putting all movie characters in the Misc Characters category. Butler kidnapped Jirachi and tried to take over the world...so yeah...that's why i put him as supporting. Makes sense. Although when you think abour it in the entire Pokémon series (The movies/TV Show/Chronicles) then he is only a Misc character. Thats the reason i've been putting all movie characters in Misc. Are we doing characters who don't own Pokémon? Like Melody from the second movie. cos Max doesn't have any pokemon, heheheh. Can I just point out that Benny is on the list of Misc Characters twice. As are Brad Van Darn, Chaz and Damien. Have you added Andie? how about Saori, Brock's neighbor from Pewter city and the cousin* of Drew? Andie owns a Perap and wishes to be the best Comedian in the world?